The main goal of the Milwaukee Farmers Market Coalition (MFMC) is to increase access to, and utilization of, farmers markets by building capacity to serve low income consumers and by attracting diverse clientele with the long-term impact of increasing produce intake within Milwaukee area communities by convening interested FMs along with healthcare, governmental, non-profit, citizens, and other partners. Our next coalition meeting is April 18, 2019 from 4 – 5:30 pm at the Milwaukee Public Library Mitchell Street Branch located at 906 W. Historic Mitchell Street. We will be meeting in Room 205. For more information about the coalition, visit Fondy Food Center. 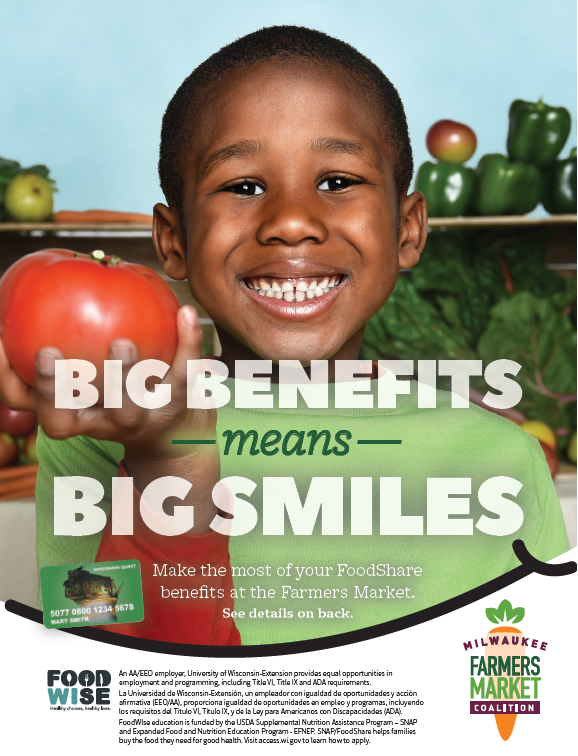 Click on the map below to find markets across Milwaukee that accept Federal Nutrition Benefits. Markets that are currently accepting SNAP/EBT/QUEST Card are represented with a picture of the QUEST Card. Stay tuned for our updated 2019 market season information! Click on the image above to to view a list of farmers markets that offer Federal Nutrition Benefits. Stay tuned for our updated 2019 farmers market list!